The question of the special status of Fort McMurray - Wood Buffalo was front and centre today as Energy Minister Ron Liepert addressed a crowd gathered for a Chamber of Commerce sponsored breakfast. First of all, let me say that I like this guy. Not only is he a survivor, getting through an embattled tenure as Health Minister, he is also a fellow Saskatchewonian like myself. 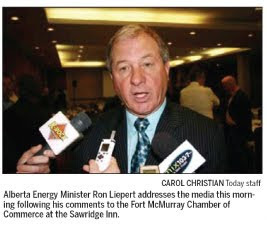 Mr. Liepert hails from Yorkton, exactly 20 minutes south and 25 minutes west of Kamsack. Secondly, I don't envy his task as the Minister in the cross hairs of the tar sands vs. oil sands war being waged by environmentalists from Toledo to Timbuktu. He's doing his best to communicate truth about what's happening in the northeastern quadrant of Alberta. And while I wish I had a copy of his speech to reference his specific points, there were several that resonated enough for me to remember. How important is the oil and gas industry to Alberta's economy? If you took away all those royalties, you'd need to levy a 16% sales tax to cover the lost revenue. Did you know that the amount of recoverable oil in the Athabasca oil sands is one of the largest known supplies in the world, second only to Saudi Arabia? In fact, the total amount of oil is far larger than what is in the ground in the Middle East, and scientists are working hard to find ways to get at it. The amount of research and development happening with respect to environmental performance in Alberta far exceeds any other province. "This is the economic engine of the province, no question," said Liepert. "That said, our goal is to treat Fort McMurray like we treat all the other major centres in Alberta. We look forward to moving this community from being special to being normal." "You said yourself that we are the economic engine of this province," said one respondent. "The fact that we are special isn't going to go away. We are special and should be treated that way." It certainly puts government in a precarious position, having to balance the needs and demands of the rest of the province, while placating the region makes the economic wheels go round. Are we special? Yes, I would argue that we are. Where else do you have to spend $750,000 to buy a nice house? Where else do retailers have to pay entry-level coffee servers $15 per hour? Where else is the rate of growth, and the potential for further growth, as high as it is in Wood Buffalo? One audience member pointed out that the Americans are looking to us to deliver 7.5 million barrels of oil per day by 2030. Think about how much growth we're going to need to withstand to quadruple our output within twenty years. Does that make us special? It sure makes us different, there's no doubt about it.